I had a request for this pattern/tutorial, and while trying to draw this out, I realized this looks WAY more complicated (even on paper) than it actually is. These directions may be a little difficult to understand, since I made this pattern up, and I am a beginner at giving people directions.. So if you need additional help or explaining please don't hesitate to ask! I did not take pictures when I made the above quilt, I am using some cute tool fabric for the tutorial. Take three strips and sew them together. Do this with all your strips. You should end up with a pile like this. Oh hey, there's my triangle sitting nicely on my sewn strips. Try and sew the strips together differently. It won't matter which fabric is on the top or bottom of the strip, but try to use each fabric in the middle, and make different color combinations. You should end up with a stack of triangles like this. You will need 72 of these to make your baby quilt. The next part is a little hard to explain. I drew a lovely picture that makes it seem like I'm still in kindergarten... But I'm gonna post it anyway! OK if you look at this drawing the pattern looks sort of like a web (which would be a totally cool Halloween quilt). When I started sewing my quilt together I was worried that it would look too webby, but I like how it turned out. You can always turn the triangles any angle you want to get the look you prefer. This quilt can be made many different ways, and I think they all look great! Before I started sewing this crazy pattern,I laid all my pieces out on the floor, and took a lot of photos before deciding the exact layout. Here is another look at how you will sew the pieces together. Sew your first row together, then sew your second row, until you have six rows of triangles, Then sew all the rows together to make the completed web (I hate calling it that, but I don't know what else to call it!). You will notice that I have a triangle in-between webs. You could use white for that or you can turn it any direction. In the above photo these triangles are up and down, but if you look at the actual quilt, I turned them sideways. These are the pieces you would put between the web, or cut in half for the end piece. After all the rows were sewn together, I added a 4 1/2 inch by 39 1/2 inch strip of white to the top and bottom, and a 2 1/2 inch by 41 inch strip of white to the sides. 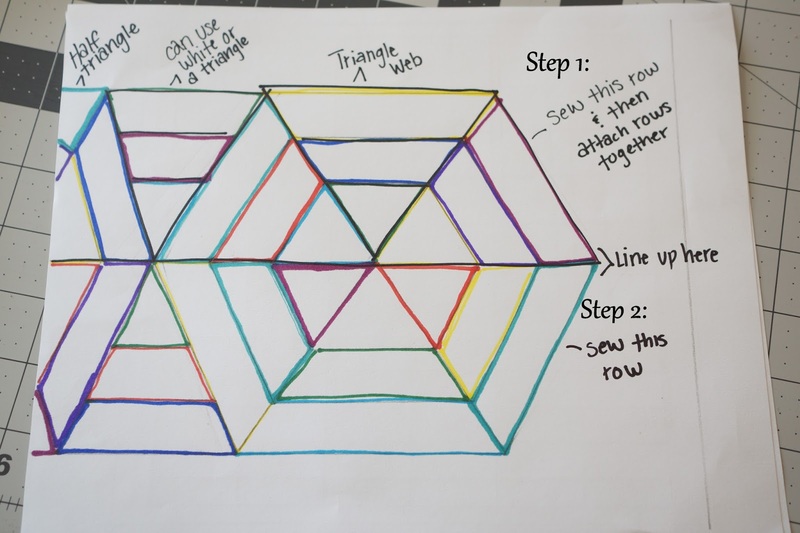 I would love to see any finished quilts using this method. I love the look of these triangles!